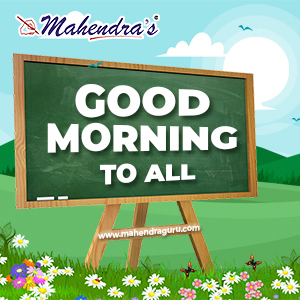 Mahendra Guru Wishes You All a very Good Morning. It is not merely a wish which is to be made, in fact it is a deep source of aplomb, energy and positivity to be shared with you to fill your minds with dreams, aspirations and creativity indeed so that you may use it as an unstoppable flow of God's bliss in achieving your motto. "To accomplish great things, we must not only act, but also dream, not only plan, but also believe."